Carol Master wants students to read, but she also wants them to go beyond appreciation of the written word. “I want them to explore a topic in all its depth, with the excitement you get from that,” said Master, chair of the English department at the Torah Academy of Bergen County in Teaneck. Together with Leah Moskovits, the school’s librarian, Master is planning TABC’s first Book Day, to be held Feb. 9. To prepare, everyone in the school is reading the same book. She added that Rabbi Josef Adler, rosh yeshiva, and Arthur Poleyeff, principal for general studies, were both supportive of her plan. “They always say yes to innovative ideas,” she said. Moskovits, now in her 11th year at the school, noted that she and Master worked together with a committee including four other faculty members, each reading the same five books and coming together to discuss them. Through a combination of presentations, workshops, music, debate, and culinary treats, Master hopes the students will become – if not experts – knowledgeable about the issues discussed in the book. “It’s a coming-of-age story,” she said, explaining that the book, named for the ancient capital of Persia, was written by an Iranian woman and describes her experiences as a young girl before, during, and after the country’s Islamic revolution. The program will include nearly a dozen workshops led by both faculty members and outside presenters, including Prof. Daniel Tsadik of Yeshiva University. 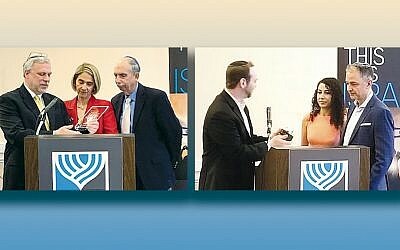 In addition to discussing the history of Jews in Iran, workshops will tackle psychological issues, “exploring what it would be like as a child living in a war-torn country,” said Master. Comic-book writers and illustrators will also be on hand to talk to students about creating graphic novels or memoirs, and Iranian Jews from the local community will speak about their own experiences. “Every student should hear at least one personal narrative about what it was like to live there, why they left, their escape, and their life here now,” said Master. The day will begin with a keynote address by Michael Schneider, secretary general of the World Jewish Congress. During the Islamic revolution, Schneider was the director of the Joint Distribution Committee for Iran. Teaneck Mayor Mohammed Hameeduddin, Bergen County’s first Muslim mayor, will also speak, focusing on the topic of tolerance. This graphic memoir about growing up in Iran is the centerpiece of an ambitious ptogram at Torah Academy of Bergen County. “It’s a huge operation,” said Master, noting that some 270 students, 30 faculty members, and 25 presenters are involved in the project. But while the logistics have been a bit daunting, “it’s been a labor of love, exciting to work on,” she said, noting that the day will include a Persian lunch. The meal will be jointly prepared by Seth Warsaw, a former TABC student who is chef-owner of Etc Steakhouse in Teaneck, and Dalia Golbari, owner of Persian Delight caterers. Book Day will also include a debate by members of the school’s debating team on the issue of a nuclear Iran. She is also pleased that the book lends itself to so many Jewish subjects, such as the Torah perspective on religion and state. Moskovits said the books were distributed to the faculty in November and to the students in December. According to Master, they were presented to students at a school assembly, where the chair of the history department spoke about the historical context of the memoir. 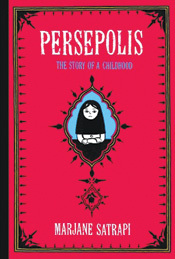 In addition, English teachers throughout the school spent a class period reading from “Persepolis” and talking about it. “Once the students started reading it, they wanted to keep reading,” she said, adding that students have also been helping to organize the event. TABC senior Noam Cohen, who lives in Teaneck, said he thought the book was a “great choice. It was a very emotional story,” he said, adding that it made him “appreciate what we have here in America, our personal freedoms.” Choosing the book was also somewhat prophetic, he said, given the current situation in Egypt and Tunisia. Ninth-grader Aryeh Krischer, 15, said he has read the book and it “opened his eyes. I don’t usually like coming-of-age books, but this was very interesting,” he said, adding that it will inform the way he now looks at Iran. Krischer, who served on the Book Day committee with 11 other students, said he will attend a personal narrative presentation as well as one on Persian cuisine. “Food is always fascinating,” he said. The Teaneck resident said the students on the Book Day committee made several important contributions, helping choose the format of the day and suggesting specific topics. “A lot of the animation [sessions] were our idea,” he said. Moskovits has been particularly pleased by the students’ level of excitement.